We offer digital marketing for venues of every type...at VenueScanner our aim is to transform venue marketing, giving any type of venue a platform to promote themselves to thousands of organisers a day. We offer multi-channel marketing support including social media, email, SEO, paid search and content marketing in addition to a premium listing on our marketplace of 12,000 UK venues, meaning you will appear at the top of search in your location. You can pick and choose what help you need and we make sure it's the most affordable marketing help on the market. What Type of Marketing do we provide? Make your venue discoverable to hundreds of thousands of meeting and event organisers through being listed on VenueScanner. As part of your marketing package you will feature at the top of searches receiving 3X more clicks than competitor venues. Geo-specialised social marketing, targeted to reach your ideal customer base and optimised to drive enquiries to your venue. Promote your offers and campaigns on the VenueScanner search engine homepage which receives >20k visits a month. Let our PPC experts run & optimise google paid search ads targeted to your ideal client and by event type. Link direct to your venue page and receive instant enquiries. Our Venue Experts discuss how best to market your space to your target audience. Many venues we work with are looking for more business clients and to drive their enquiry numbers up. If this is you, check out the Venue Marketing Service. As with any marketing campaign, the most crucial starting point is to understand who you want to find your venue. The last thing you want to do is spend budget driving irrelevant enquiries. E.g. Are you looking for “large corporate” bookings? If yes you will want to be targeting personal assistants. Looking for wedding bookings? You might want to think about finding people on “Pinterest” creating wedding boards…or targeting people who’s relationship status changes to “engaged” on Facebook! When you use pay per click channels, you are paying for every visitor to your website. When marketing on “commission” based channels you are only spending money for Guaranteed return [ROI]. Although you are reducing your margin which often makes more business sense for your profit margins. Know The one thing everyone loves…. Captivating images. Instagram has turbo charged the way that imagery is used to sell. Customers of all sorts, but especially event organisers look at images as the first thing that drives them to enquire (and if a short-lead time enquiry book) with. Make your imagery amazing, invest in it and then push it through all your partners and marketing channels, especially social media and affiliates/marketing platforms. Peer to peer marketing is and always has been the most effective type of marketing. This applies in digital as well as word of mouth. Ensure you ask your customers to rate and review their experience with you and then enable them to easily share and recommend your venue online. Be smart about what digital channels you use and where you can get the highest reach. 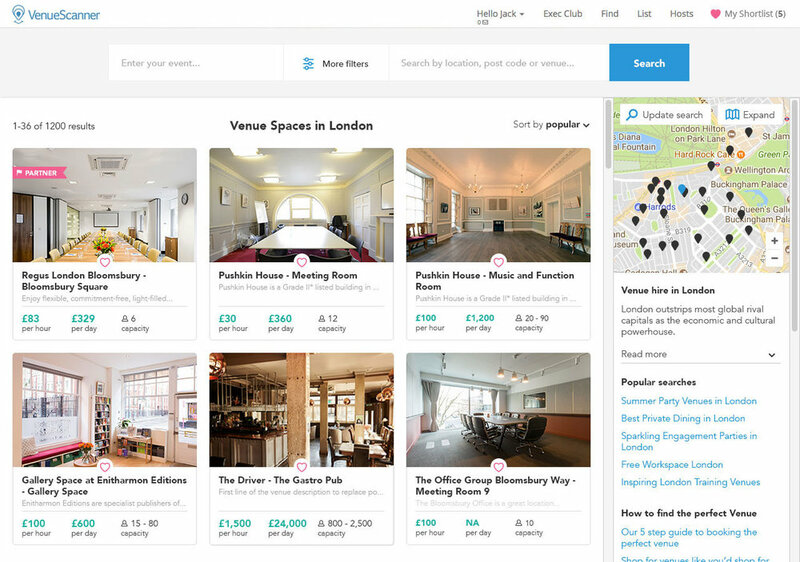 Ensure your venue is discoverable on the most visited and most relevant platforms. 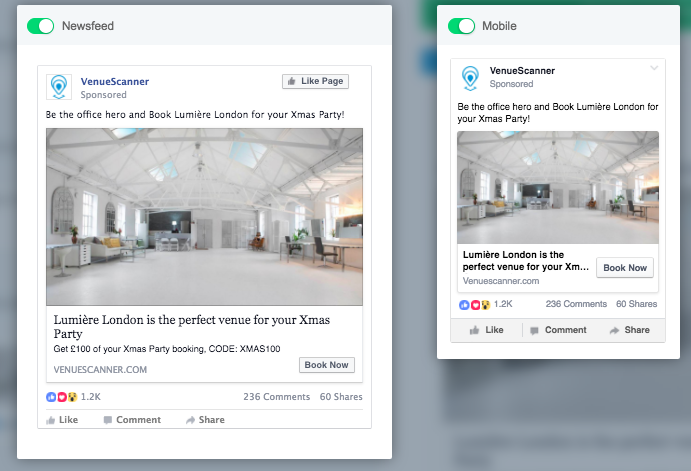 This might be publishers like, “The Nudge” “Timeout”, specialist publications such as wedding planning websites or aggregator platforms like meetingsbooker.com, appearhere.com and of-course venuescanner.com! These websites will be taking advantage of economies of scale through heavily investing in search engine marketing, ensuring they capture thousands of organisers a week so if it’s right for you look to feature on all that are relevant. Find out how VenueScanner worked with CIEE to market their classrooms as event spaces! Find out why we think that the everyday pub can be re-imagined and used. Take your board meetings out of the boardroom and into the local pub . Find out why many of our venues missed out on their sales targets last year and top tips for smashing them in 2018. Sometimes Hotels can be a little dull...not Sanctum Soho! Find out how they smashed the christmas party season last year!